(Phys.org) —In August 2011, researchers from the U.S. Department of Agriculture were presented with a serious, and potentially very costly, puzzle in Kennewick, Wash. 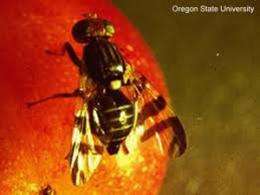 Since Kennewick lies within a region near the heart of Washington state's $1.5 billion apple-growing region, an annual survey of fruit trees is performed by the Washington State Department of Agriculture (WSDA) to look for any invading insects. This time the surveyors discovered a crabapple tree that had been infested by a fruit fly that they couldn't identify. It was possible that the fly's larvae, eating away inside the crabapples as they grew toward adulthood, belonged to a relatively harmless species that had simply expanded its traditional diet. In that case, they posed little threat to the surrounding apple orchards in central Washington. But the real fear was that they represented an expansion in the range of the invasive apple maggot fly, known to biologists as Rhagoletis pomonella. If so, then this would trigger a costly quarantine process affecting three counties in the state. "In one of the world's leading apple-growing regions, a great deal of produce and economic livelihood rested on quickly and accurately figuring out which one of the flies was in that tree," says Jeffrey Feder, professor of biological sciences and a member of the Advanced Diagnostics & Therapeutics initiative (AD&T) at the University of Notre Dame. "And for these flies, it can sometime turn out to be a difficult thing to do." As Feder and his team, including graduate student Gilbert St. Jean and AD&T research assistant professor Scott Egan, discuss in a new study in the Journal of Economic Entomology, the WSDA sent larvae samples to Wee Yee, research entomologist at the USDA's Yakima Agricultural Research Laboratory in Wapato, Wash. One larva was sent to Notre Dame for genetic analysis. The study sought to compare Notre Dame's genetic analysis to Yee's visual identification after the larvae had developed into adults. Fortunately, the fly identified, Rhagoletis indifferens, is not known to infest apples. The Notre Dame group further demonstrated that it is possible to genetically identify the correct fly species within two days, compared to the four months required to raise and visually identify the fly. A separate study led by the Feder lab details how the apple maggot fly was recently introduced into the Pacific Northwest region of the U.S., likely via larval-infested apples from the East. The flies have subsequently reached as far north as British Columbia, Canada, and as far south as northern California. So far, though, the apple maggot has not been reported infesting any commercial apple orchards in central Washington. "The correct identification of the larvae infesting crabapple trees saved the local, state and federal agencies thousands of dollars in monitoring, inspection and control costs," Yee said. "The cost to growers if the apple maggot had been found to be established in the region would have been very substantial (easily over half a million dollars), but the rapid diagnostic test developed at Notre Dame suspended the need to proceed with the rulemaking process, saving staff and administrative costs." The Feder team is continuing to refine the genetic assays to develop a portable test that would be valuable in apple-growing regions, as well as ports of entry where fruit infested by nonlocal insect species can be rapidly detected, to prevent the spread of the insect.